With U.S. Senate candidates required to file for their state’s primary within the next 12 months and many incumbents needing an early start to their campaign in the wake of challenging reelection prospects, the vast majority of the 33 lawmakers up for election next year have already launched their 2018 bids. At one point it was thought that octogenarians Dianne Feinstein of California and Orrin Hatch of Utah would retire (Hatch had said as much after winning his seventh term in 2012), but both are poised to run again this cycle. A few of the nearly two-dozen Democrats up for reelection are still playing it coy, like Heidi Heitkamp of North Dakota, Tom Carper of Delaware, and Ben Cardin of Maryland, as well as Republican Bob Corker of Tennessee. Another Democrat – New Jersey’s Bob Menendez – is running for another term, but has the potential to bow out if things go south in his corruption trial that is scheduled to begin later this year. However, thus far, none of the 33 incumbents have announced that they won’t be running for reelection, which raises the question of whether or not such a scenario has ever played out during the direct election era. A Smart Politics analysis finds that there have been at least two U.S. Senators who did not seek another term in each of the 52 election cycles since the passage of the 17th Amendment in 1913. Nearly 300 U.S. Senators have retired from the chamber since 1914 – excluding those who resigned midterm – averaging 5.5 senators per cycle. That number has been elevated in recent years, with 7.2 senators retiring over the last 13 cycles during the last quarter-century (1992-2016). It’s been more than 50 years since the last time as few as two Senators did not seek another term. In 1964, only Arizona Republican Barry Goldwater (who ran for president) and Tennessee Democrat Herbert Walters (appointed to his seat after the 1963 death of Estes Kefauver) did not suit up for another term in the chamber that November. Alaska is the only state never to have one of its U.S. 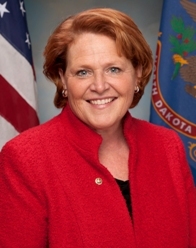 Senators retire at the end of his or her term in the direct election era. Three were defeated in the general election (Ernest Gruening in 1968, Ted Stevens in 2008, Mark Begich in 2014), one was knocked out in the primary (Mike Gravel in 1980), one died in office (Bob Bartlett in 1968), and one resigned to become governor (Frank Murkowski in 2002). Previous: How Many Trump States Will Back Democratic US Senate Nominees in 2018? 3 Comments on "2018 Could Have Fewest US Senate Retirements in Direct Election Era"
1. Retirement Watch: Feinstein may well have chosen to call it a career and stand down if “H” were in the WH rather than “T” (fellow San Franciscan Nacny Pelosi recently stated as such). 2. DNL Senator Kent Conrad in fact did both in 1992; he did opt against seeking re-election for the seat that he won in 1986 (older people may recall that he made this unrealistic pledge about paring down the US trade and/or budget deficits by at least half during his first term. Really?) but when the inaugural DNL Senator Quentin Burdick unexpectedly passed on in the late summer of 1992 Conrad found the way to both honour his pledge and remain in the Senate. 3. AK: Actually, THREE incumbents were “knocked out” in their party primaries; 2 of those – Gruening in 1968 and “liberal” Lisa, daughter of Frank in 2010 – chose to make their case to the entire statewide electorate (a la Joseph Isadore Lieberman in ’06/CT). RE #3. I chose that wording carefully as Gruening and L. Murkowski were technically not knocked out of their US SEN seats in the primaries (though they lost them) as they continued to fight on in the general election (unsuccessfully and successfully respectively). RE #2. Conrad, unlike Minnesota’s Ball, did not have a gap in service in the chamber when switching his class of US SEN seat. RE:RE #2 Joseph H had a (small) gap in his tenure not because he switched seats but because his interim appointment ended right after the next election (even though it was not for a by-election) rather than the expiration of the predecessor’s term in the Class 2 seat (Arthur Nelson became interim interim senator, serving alongside Class One’s Henrik Shipstead for that 2-month in-between period).